Standard quality control of each lot Western blot analysis (unlabeled antibody, #ATR-001), and immunocytochemistry (labeled antibody). 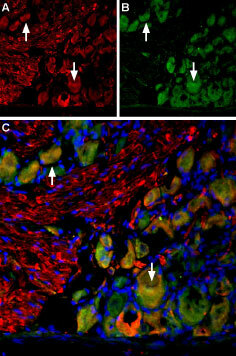 Immunohistochemical staining of rat colon paraffin-embedded section using Anti-Neurokinin 1 Receptor (NK1R) (extracellular)-ATTO-488 Antibody (#ATR-001-AG), (1:100). 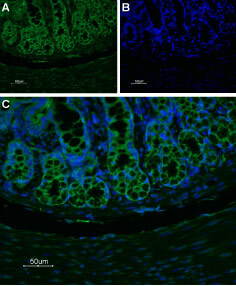 A. NK1 receptor labeling (green) appears in the tubular glands of the mucosa layer. B. Nuclear staining using DAPI. C. Merge of panels A. and B.
Immuno-colocalization of Noradrenaline Transporter (NET) and Neurokinin 1 Receptor (NK1R) in rat brain stem.Immunohistochemical staining of perfusion-fixed frozen rat brain sections using Anti-Noradrenaline Transporter (NET) (extracellular) Antibody (#AMT-002), (1:400) and Anti-Neurokinin 1 Receptor (NK1R) (extracellular)-ATTO-488 Antibody (#ATR-001-AG), (1:80). A. NET staining (red) in section of rat locus coeruleus. 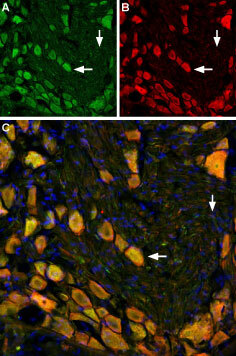 B. NK1 receptor staining (green) in same section. 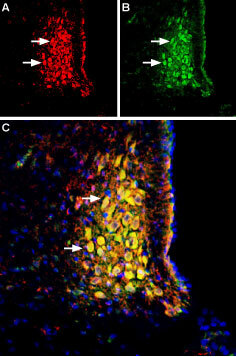 C. Merge of the two images reveals several cells expressing both NET and NK1 receptor (arrows). Cell nuclei are stained with DAPI (blue). Anti-Neurokinin 1 Receptor (NK1R) (extracellular)-ATTO-488 Antibody (#ATR-001-AG) is directly labeled with an ATTO-488 fluorescent dye. ATTO dyes are characterized by strong absorption (high extinction coefficient), high fluorescence quantum yield, and high photo-stability. The ATTO-488 label is analogous to the well known dye fluorescein isothiocyanate (FITC) and can be used with filters typically used to detect FITC. Anti-Neurokinin 1 Receptor (NK1R) (extracellular)-ATTO-488 Antibody is especially suited for experiments requiring simultaneous labeling of different markers. Anti-Neurokinin 1 Receptor (NK1R) (extracellular) Antibody (#ATR-001), (for western blot analysis). Anti-Neurokinin Receptor 1 (NK1) (extracellular) Antibody (#ATR-001). This antibody recognizes an extracellular epitope and be used to detect NK1 in live cells.